Many components of the lesson plans below have been passed along to me by various artists and art teachers over the years. I can’t – and won’t – take credit for all the hard work they’ve been through developing various successful approaches to teaching art, history and technique. Other components have been provided by the kids themselves – usually the most important ones! The overall goal of this three-week session is to introduce the principals, practice and activity of painting to students, K – 3. This introduction will be implemented through a series of lesson plans of activities that include exposure to paintings as well as basic history of the painters Henri Matisse, Claude Monet, Henri Rousseau and Vincent Van Gogh; classroom painting activities that support the influences of these painters; stories; visual aids; introduction to and practice with painting materials and tools. In this lesson, students will explore the medium of watercolor paints. 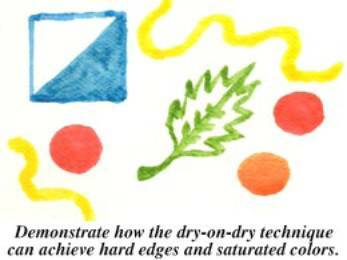 They will observe basic watercolor painting techniques (such as wet-on-wet, wet-on-dry and dry-on-dry). 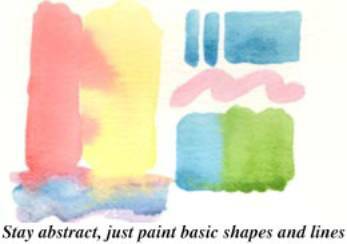 Then students will experiment with these techniques on small squares of watercolor paper. Perceive the qualities of watercolor paints. Observe and demonstrate understanding of basic watercolor techniques. Students may have some experience with using watercolor paints. They will learn how to use a brush correctly and will learn how to rinse brushes properly as they work and keep paints clean. Reproductions of landscape paintings that show different paint media and/or teacher examples of landscapes in different paint media (watercolor, tempera, acrylic, or oil paint). These can be quick demonstration paintings. They are just to show the different qualities of watercolors vs. other paint media. Gather landscapes in different paint media and/or create samples. Gather studio materials and plan set-up. Set-up teacher demo area to show watercolor techniques. Arrange classroom furniture to create a discussion area to ensure maximum participation and ability to see visuals. Group discussion: Have students examine the examples of landscapes made with different paint media. Guide students to see the different qualities of the media the examples represent. Have them draw on their own experiences with media to compare and contrast different paints. Eventually, focus their attention on the watercolor examples. 2) Has anyone ever used _____paint? What was it like? Was it hard or easy? What do you like about ____ paint? What do you find challenging? 3) How are watercolors different from other media? Watercolor paints are often more fluid or flowing than other paints. They are sometimes diluted and transparent rather than opaque. Watercolor paints are not built up in thick layers. Sometimes you can even see patches of paper left unpainted. You usually cant paint over mistakes the way you can with other paints! Note: As many adults see watercolors as cheap, easy-to-clean-up paints, they are often a child’s first painting experience. Yet watercolors are difficult for younger children to control…especially on regular paper. Many students may remember being frustrated with earlier watercolor painting. They may recall puddles and runny paint drying into curled, rumpled disasters. Less-is-more is a difficult concept for young children. So early painting attempts may have led to dull, grayish colors and paper scrubbed clean through by enthusiastic brush strokes. Acknowledge any skepticism from the students about watercolor painting and let them know I’ll be showing them some new techniques to achieve beautiful paintings! We’ll begin with an introduction to painting, painters and some recent history of painting to establish some perspective before jumping into the art demonstration. Review any brush-holds, rinsing procedures, and blotting techniques they will need. Go over classroom procedures for getting clean water etc. Pass around some squares of watercolor paper and point out how it is different from regular paper. Even student-grade watercolor paper will give students more control over their paints and will help prevent pooling, uncontrolled bleeding and curling. You may also want to point out its greater expense and direct them to scratch paper for color testing and practice brush strokes. Remember that each grade will focus upon their particular subjects—background, middle ground, foreground, objects, etc. Explain: A wash is a very thin coat of paint. You can still see the paper underneath a wash as it is transparent. Washes are good for flat, light areas like sky or a large body of water. On the back of one paper square, write your name and "wet-on-wet" or "wash." Make sure students pre-label the back of each piece of paper before painting. Explain that washes are created using a technique called "wet-on-wet." This simply means you are painting with a wet brush on wet paper. 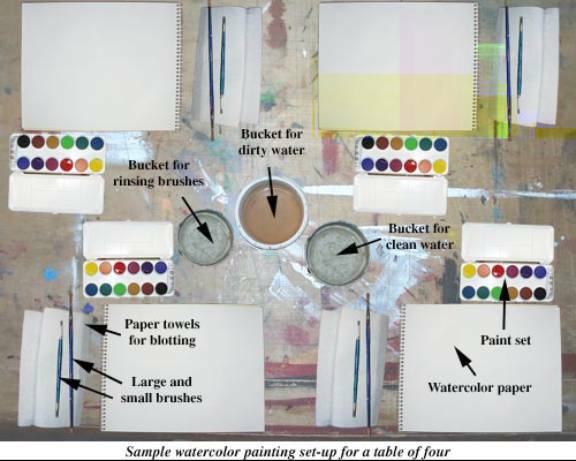 Take a thick brush and paint clean water evenly across your paper. The paper should become wet but not drippy... no puddles. Select a color and paint across the paper in a horizontal band. Continue with the same color or choose another color paint a band next to it. Show your students how the colors bleed and blend together where they meet. Continue painting. Point out that you brush once or twice then leave it alone…don’t go back and brush over it (you aren’t "painting a fence!"). Let the paint blend and surprise you! Set aside to dry. This technique is well-suited for the painting areas that require greater control and more saturated colors as in the foreground of a landscape. Wet-on-dry means you work with a wet brush on dry paper. Paint abstract shapes and lines. Experiment with the brush and the amount of paint and water than you use. Blend colors and note how they bleed when they hit other wet spots and stay put when they are applied to dry paper. Encourage students to experiment and stay abstract. By blotting your brush dry and applying it to dry paper you can get interesting textures, hard edges or really saturated colors. Try out different brush strokes and amounts of paint. Encourage students to experiment and discover the effects this technique provides. Have your students try the various techniques and experiment on their practice squares. Remind them to put their names and label the technique on the back of their squares before they start painting. Set aside to dry. If you wish, you may continue on to the Watercolor Landscapes Lesson. I will outline this classroom approach to the adult audience using a PowerPoint presentation. I will need a computer and a Projector for this demonstration, along with a table to set up materials as a visual aid. Display your collection of landscapes to students. Ask them to describe what they see (land, weather, tiny figures or buildings#). Explain that a landscape is a picture in which the land is the most important subject. Using your immediate surroundings, ask your students to locate land and sky. Do they meet? Ever? Do they meet in the landscape prints shown? Using your plain white paper strips, mask over the horizon in one landscape print. How does it look to the children? What’s missing? That spot where the sky and land APPEAR to meet! Identify that spot as the horizon. You could also demonstrate the common "mistake" of drawing a landscape with a band of sky and a band of land and contrast it with landscape in which the sky and land meet. Explain that they will begin a landscape painting today. First they need to gather ideas for the subject of their landscape. If a "field trip" is not feasible, your students can get ideas from a "picture file" of landscape magazine photos. You could then also skip the viewfinder steps and proceed to the under-drawing. If possible, explain you will take your students on a quick field trip around school (outside if the weather permits). Show your students your viewfinder and demonstrate its use: look out the window and hold the viewfinder out at arms length. Describe to them what you see. Move it both horizontally and vertically and move so that you are looking at something different. Pretend to take pictures of the views that you are seeing. Explain that artists look carefully and plan their landscape compositions. 1) Hold a piece of construction paper horizontally and fold it in half. 2) Use your pencil to trace a 2-3" square in the middle of the fold. 3) Cut out the square and unfold the construction paper. Voila! A viewfinder. Pass out the construction paper, pencils, cardboard squares, and scissors. Guide students through the making of their own viewfinders slowly, step by step. Watch that your students cut ON THE FOLD. It’s a common mistake. Take students outside, or to a large window where they can use their viewfinders. Guide them through the use of their viewfinders, if necessary by repeating a demonstration. As they are experimenting with their viewfinders, encourage them to move it so that the horizon line goes up and down. Have students pretend that they are taking pictures to take back to the classroom. Back in class... what do the students remember about their pretend "pictures?" What happened to the horizon when they moved their viewfinders up and down? In which position did they see the most sky? Or land? Show students the three examples of the project, and explain that today they will make an under-drawing (a light drawing) on their paper to show where the horizon will be. Show students how to estimate ¼ of the way up the paper by first making a light mark at half and then half again. That is the level at which they make their horizon. Demonstrate an under-drawing and save that example for your own use in the next lesson. Pass out the watercolor paper and pencils. Encourage students to use their imaginations when they make their horizons. Even though they needn’t put in details, they can certainly make their landscape horizons show any type of topography. Use the selection of landscape prints from the beginning of class to show the possibilities. You could talk about the difference between realistic and abstract styles. When students are finished with their under-drawings, have them write their names on the back. Collect their under-drawings and save them for the next lesson. Students can keep or recycle their viewfinders. Bring several examples of your own work, especially the ones that flopped! Share any tips you have from your own experience and experimentation. Spend a lot of time with your demonstration and don’t assume they know anything. The actual painting activity won’t take long at all. Review the concepts of landscape and horizon. Using your images of landscapes, call on students to identify the horizons. In which pictures do they see the most and least sky? Explain that artists sometimes draw attention to a certain part of a picture by making it bigger or more colorful. That is the center of interest or focal point. Sometimes the land is the center of interest and sometimes it is the sky. Ask students to speculate as to the importance of sky and land in the pictures they see. What colors did the artist use? Are artists styles realistic or abstract? What media did they use? Point out the qualities of watercolor paints if you have a good example. Using your own watercolor painting as an example, ask children to identify the most important part of your work. 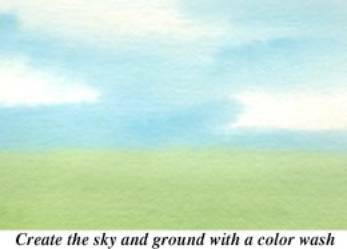 Explain that they will create a colorful sky by using a watercolor wash. Using your own under-drawing, show students where everyone will be painting today. Demonstrate a self-evaluation of your under-drawing by asking yourself out loud "I want people to notice the colorful sky I am going to make today. Is my horizon in the right place? (It should be low enough on the page to have room for lots of sky) Do I have enough space to make a big and colorful sky?" Correct your light under-drawing with an eraser in one or two places to demonstrate that artists change things as they work. Gather students so that everyone has a clear view of you. Warn students that you will be working rather quickly at times. Identify your supplies, and give a running commentary of everything you do. 1) Decide what colors you would like to use. Add some water to these colors and work it into the paint. But don’t paint on the paper yet! 2) Use your wide brush to thinly paint clear, clean water over the entire area of your paper ABOVE the horizon line. No puddles -- demonstrate how to gently dab up puddles with a clean paper towel…no scrubbing. 3) Talk about your color choices to make a bright, beautiful sky. Use your brush to add your first color of paint to the paper. Watch how the paint spreads, then add the rest of the colors next to but NOT ON TOP OF the first color. Resist the temptation to paint over what you have already done. 4) When you are finished painting, PUT DOWN THE BRUSH. Pick up your painting and gently tip it from side to side just once or twice, allowing the colors to blend even more. 5) That’s it! You told them it would be quick! Show them where to dry their paintings. Pass out under-drawings and pencils first so students can evaluate their work and make any changes. Discourage vigorous erasing, as it will damage the paper fibers. When students have all their painting supplies, lead them through the process of a watercolor wash step-by-step, then have them immediately put their paintings in a drying rack. Its not hard to come up with an interesting painting. Do warn your students against scrubbing their paper. This causes the paper to pill and the watercolor to loose its natural luminosity. Over-enthusiastic students have been known to drill right through the paper with too much brushing! Lesson 3 c Details, Details! Explain now they will finish their landscapes by painting the land. Remind them that they still want the sky to be the center of interest…colorful and beautiful watercolor washes. So they will be creating land silhouettes. While pointing to your finished example painting, explain that a silhouette is an outline filled in with one color against a light background. Ask for a show of hands of who has seen a beautiful sunset. Turn out the lights in the classroom and use your flashlight to illuminate a bare piece of wall. Hold the ball and wheel just in front of the flashlight. Demonstrate that silhouettes can be detailed by juxtaposing the solid silhouette of the ball with the detailed silhouette of a wheel. Do the same with the mitten versus your open hand. Don’t rush through the concept of silhouette. Encourage students to think about what makes an interesting silhouette. Have your detailed drawing of a horizon completed and ready to paint. Quickly review what your students have already accomplished. Gather students in the same manner as with the watercolor wash demonstration. Give a running commentary of every step and decision you make. 1) Show children your light drawing of the horizon details. 2) Add just enough water to moisten the black paint. This is NOT a wash…do not wet the paper! Demonstrate how to blot excess water by dabbing your brush on a paper towel. 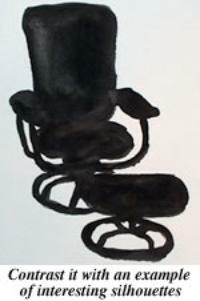 3) Beginning with the detail highest on the page, paint your silhouette of your horizon black. 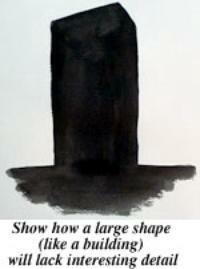 4) Move down the painting slowly, filling in the rest of your silhouette. 5) Move painting aside to dry. Pass out each child’s dried watercolor wash and a pencil for drawing in the horizon details. Encourage students to use their imaginations to create any landscape from any country and any era they choose. Let the pictures you brought today inspire them! Set-up for watercolor painting as before. (Or you may choose to have watercolor painting stations that students go to paint when they are ready). Allow paintings to dry in a Drying Rack . When they are completely dry you may need to flatten them under some heavy books. Students can mount them on colored Construction Paper , title and sign them for display. Each grade will be introduced to painting through exposure to various examples of paintings along with stories of such painters as Henri Matisse, Henri Rousseau, Claude Monet and Vincent Van Gogh. Stories will be brief and lively to keep short-attention spans in check. Emphasis will be placed on the actual activity of painting. Each lesson plan will be modified for age and grade. Kindergarten classes will focus on painting larger, more basic shapes and forms such as mountains, skies and clouds – organic and free-form shapes. They will work with a palette of cool colors that are bright and light. First Grade students will work with slightly more complex shapes, including a variety of simple tree shapes and foliage such as leaves. They will also work with cool colors, but will have both lighter and medium dark values. Second Graders will focus on still more complex shapes that may include simple architectural forms such as houses or buildings – subjects that include detail and straight edges in places. They will work on Palettes that include both warm and cool colors which have light and medium values. Third Grade classes will concentrate on the most complex shapes and colors of the four grades, with emphasis on figures such as people, animals and crips foreground shapes such as foliage. This variety of subject matter will include both organic, free-form shapes as well as straight lines and details. The will work with a palette of warm colors which have light, medium and dark values and bright tonal scales. As the pieces of the mural come together into a final, single landscape, the elements of form, cool and warm colors, perspective, color, shape and line will merge together into one picture. This picture should demonstrate a collective basic understanding to the principals of painting. In the classroom, I will typically use the lesson plan to hand off to the regular classroom teachers so that they've got something they can refer back to later on... sort of a "Do it yourself" plan. I start with the day's goal -- learning to use the round brush, for instance -- and from that point onward I am engaged with each particular class situation in a very, VERY spontaneous approach. I ad lib a LOT, a big part of my approach is loosely orchestrated and is kind of performance art in a way! Because I have a bag full of anecdotes about art, painters, Impressionists -- whatever -- I throw that into the mix, walking around the room working one-on-one with each and every kid for a minute or two and then moving along to the next, gabbing constantly. Frankly, it's exhausting but a lot of fun for me, the teachers and the kids. 1. Kids were introduced to the various tools -- I've got a fun little shtick I run through with brushes, for example, where the kids learn that the round brush is the "painter's pencil" and the flat brush is the "Marine" -- it's much tougher than the round brush and it's got a Marine flattop haircut, etc. Basically, kids are introduced to watercolor painting, one brush stroke style at a time. The classrooms are filled with large color reproductions of Monet, Van Gogh, Degas -- and then some of my other favorite (though' not necessarily Impressionist) painters -- Bonnard and Matisse. Day one, we use the flat brush and get really messy, really wet, learning about washes and what happens when colors run together. Day two is all round brush work -- no flats at all -- and we work strictly with lines, allowing the paint to dry before laying one line of color over another. Day three is a combination of the two brushes, and so forth. I try to keep the younger kids focused on large things: a full sheet of clouds or water (and of course, the magic of SALT!) and they immediately start to see their work as "underwater" or as the Northern Lights (the salt, of course) instead of as a little tiny object in the center of a large piece of paper. Plus, I intentionally use large brushes so they aren't even given a ghost of a chance to work on tiny little details. We reference the big brush strokes in the large color reproductions and... they just GET it. The Impressionist painters are PERFECT for getting kids excited about painting: they don't get frustrated when they can't paint a Mona Lisa on the first try but they really dig it when they see the cruder brush strokes of a Van Gogh turn into a picture of beauty. 3. Anyway, the kids and I started to separate each painting into piles: mostly blue, mostly red, mostly rough texture, mostly smooth, etc. The mural itself is, as I recall, about twenty feet wide by eight feet tall. It's based on a rough sketch I made and presented to the school. Collectively, the kids and I used an opaque projector to transfer the sketch in sections to large sheets of corrugate, each piece 4' x 8' in size. Then we started to rip! 4. Ripping chunks of painted paper roughly by hand, we formed the contours and shapes of the components of the mural (to see the mural, go to my site at http://www.ideacreative.com/murals.html -- the second and third images on that page are this particular project.) We glued the pieces in place to create a mural that represents the view from Kalifornsky Beach Elementary School -- that of Cook Inlet, the volcano Mt. Redoubt and various animals found on the Peninsula. These were placed on the corrugate with Spray Adhesive WHICH I OPERATED. I cannot stress this enough -- spray adhesives get into the lungs and are carcinogenic. The kids were very disappointed not to be able to be involved with the gluing but the risks are too great. Since then I have done similar kinds of projects and used Acrylic Matte Medium instead of spray adhesive. Trust me on this: it's a FAR better way to go, nontoxic, easier to clean up and much better as a process. 5. The PTA had a member who owned a cabinetry shop and who installed the mural permanently at the school. It was placed onto a hardwood substrate, framed in with wood trim and then covered with Plexiglas to keep the very fragile components of the collaged mural protected and in place. I recall that they had some kind of air access that needed to be provided in covering the art with Plexiglas -- something to do with fire code.